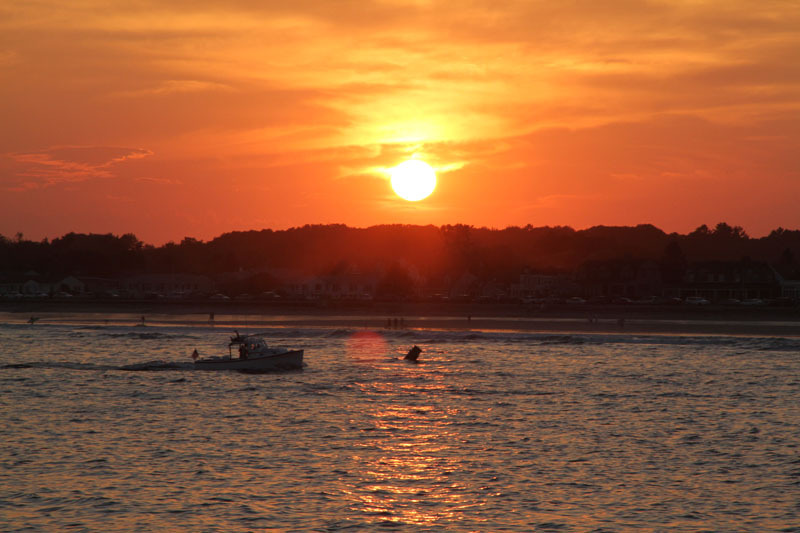 What’s the most beautiful time of year in Kennebunkport? Many would say summer…but fall is magical on the Maine coast and especially in the beautiful seaside town of K’port. In September and October you can still walk the beaches of Gooches, Mother’s Beach and Colony Beach in Kennebunkport…and it’s a much easier to find that parking space along Beach Ave. Fall brings cool crisp evenings, while you still have warm sunny summer days. The temperatures in Maine in fall are splendid 70-s by day and 50’s at night for perfect sleeping under a down duvet at a local Kennebunkport inn or cozy bnb. You can sit by the fire on a fall evening, but wear shorts as you walk along Ocean Ave during the day. 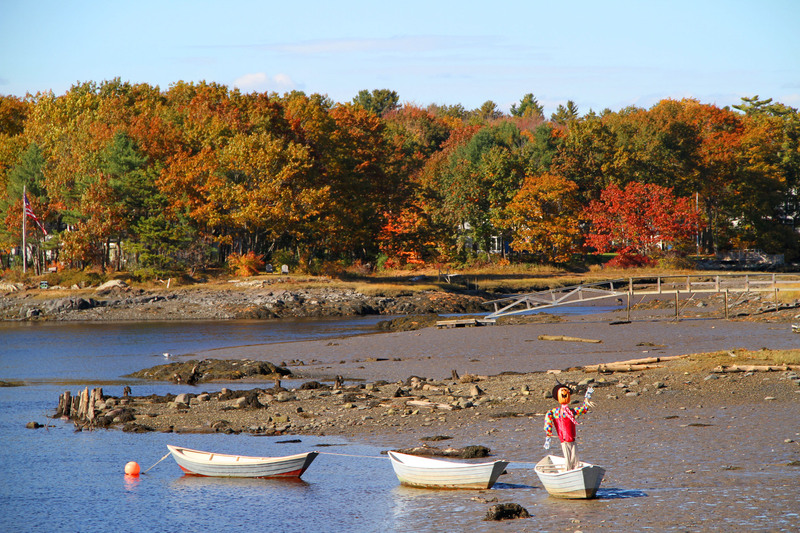 As for fun things to do in the fall in Kennebunkport, boat rides are fantastic. Get aboard a charter lobster boat or sailboat to see the coastline and the gorgeous leaves changing colors in contract to the brilliant blue Atlantic Ocean…there’s nothing like it anywhere else in the world. Just bring a jacket for that fall boat cruise, we recommend the Pineapple Ketch sailboat charter and the Rugosa Lobster Boat tour that both leave from the Nonantum Resort on Ocean Ave. If you’d like to have your own private cocktail cruise or a boat ride out to Goat Island Light in Cape Porpoise, you can charter Libreti Rose Fishing Boat with your own party, bring your own beer or wine, fish fro striper with Captain Bruce, or sit back and relax and enjoy the boat ride out the Kennebunk River to the open ocean with your professional captain at the helm. 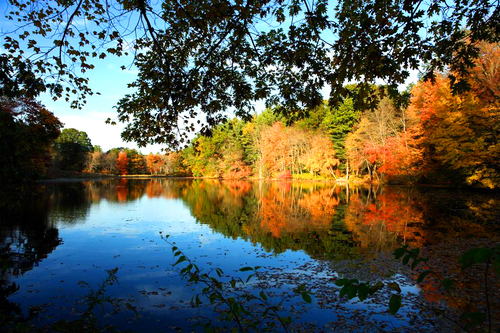 Kayaking and Canoeing the Kennebunk River in the fall is fabulous. You can rent kayaks and canoes at Kennebunkport Marina or from Kayak Excursions (thru mid-September). The boat traffic is much reduced in fall versus the busy yachting summer season, and the fall foliage along the riverbanks is extraordinary. And you don’t get too hot, since the fall temps are cooler as you canoe your way up and down the river. When kayaking the Kennebunk River, be sure to go with the flow- check the tide chart and head up river during an incoming tide for a nice push, planning your return with the push of the outgoing tide -with perhaps a picnic at Picnic Rocks beyond the Cape Arundel Gold Course on the River at slack tide. Biking around Kennebunkport and Kennebunk in fall will deliver you to beautiful tree lined streets and foliage covered pathways like the Eastern Trail that leads you along a gravel path to Biddeford. The Kennebunkport Conservation Trust has several wonderful bike paths behind their Headquarters on Gravely Brook Drive – called the Edwin L. Smith Preserve. The cooler temps make biking in fall delightful, the display of autumn leaves and the crunch of oak, maple and birch leaves under your tires is terrific. Apple picking at Spillers Farm in nearby Wells, where you can also visit their farmer market for locally harvest fruits, vegetables and farm raised beef, chicken and eggs. Giles Family Farm in Alfred has pick your own apples and pumpkins. In Springvale, McDougals Orchard offers pick your own apples and pumpkins in a pretty historic farm setting. Along with the changing leaves, fall ushers in fair and festivals, harvest festivals at the Farmers Markets, and craft fairs at the Village Green in front of the Captain Lord Mansion. The Pumpkin Trolley Patch at the Seashore Trolley Museum is an annual favorite where you ride the trolley and pick your own pumpkin, as is Halloween on Summer Street In Kennebunk when the owners of the historic sea captains’ mansions decorate their historic homes to the hilt in scary spider webs, candles and creepy haunted themes. Of course shopping in Dock Square and Lower Village, plus main Street Kennebunk are always in season. Fall brings post-summer sales to some of the Kennebunkport boutiques, so it’s a shoppers delight – followed by lunch of clam chowder or a lobster roll at one of Kennebunkport’s waterfront restaurants, Alisson’s, The Boathouse Hotel or Stripers at Breakwater Inn overlooking the river. The simplest pleasures of fall in Maine include reading a book by a fire in a seaside inn like Nonantum or Captain Lord Mansion, or enjoying a walk on the beach followed by an outdoor hot tub overlooking the ocean at the Seaside Inn or a swim in the indoor heated pool and a soak in the outdoor hot tub at Rhumb Line Resort. Kennebunkport’s beats restaurants stay open through the fall and all year round- and they serve lobster always! What a way to end your day. The sunsets in Kennebunkport come fall are particularly splendid and the night skies fill with stars more than the other seasons. For lodging in The Kennebunks, see our Kennebunkport Lodging Guide and our Kennebunkport Events Page for all the goings on all year long in the Kennebunks.